Posted in red devils with tags bill bateman, block, feelgood, lester butler, moulin blues festival, red devils on December 3, 2011 by J.J.
Dutch blues magazine Block was an early supporter of The Red Devils, continuing through the 13 years as well. 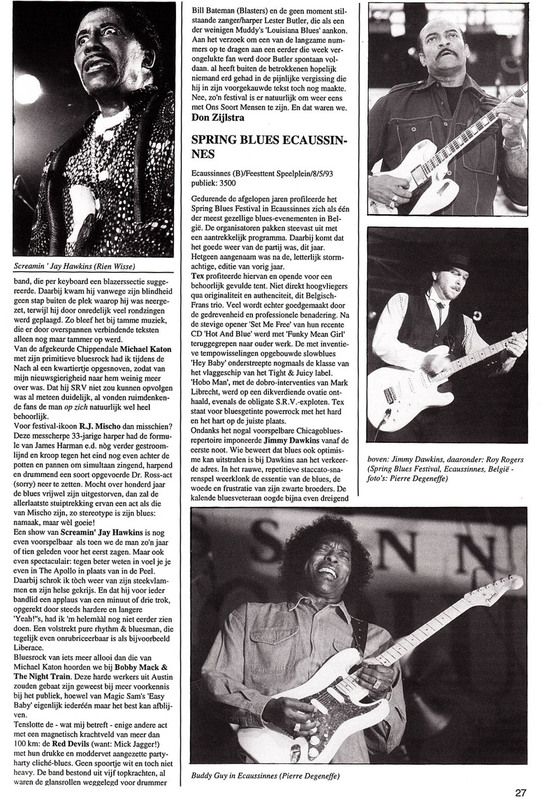 This review of the the 1993 Moulin Blues Festival comes courtesy of Feelgood. We’ve done our best to do a translation of The Red Devils’ mention — if you have a better translation, put it in the comments. Also included: A Block ad for the festival. Finally — I think — the only other act with a magnetic force field of over 100 km: the Red Devils (because: Mick Jagger!) 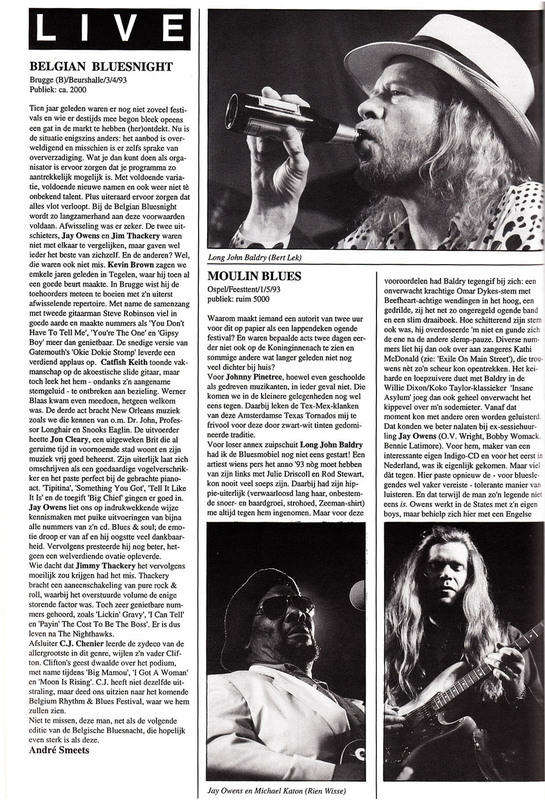 with their busy and fat-accentuated party hardy clichéd blues. No trace of white and yet not heavy. 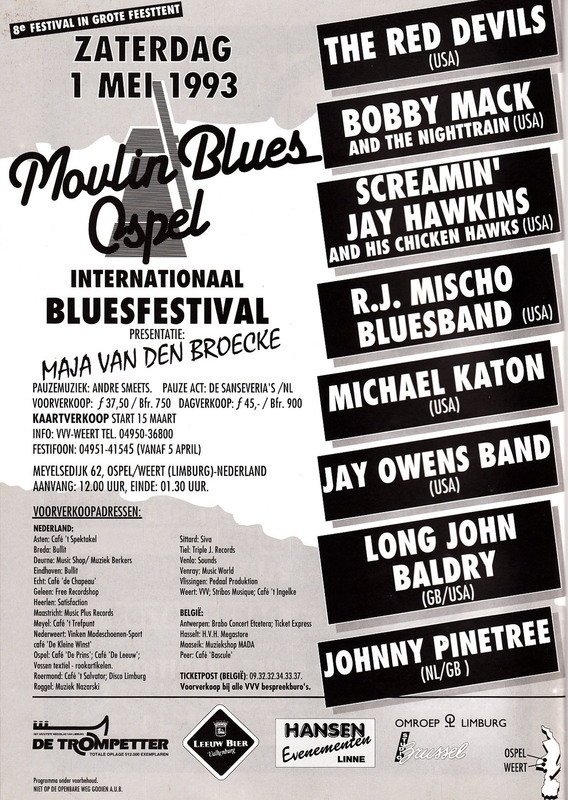 The band consisted of five top strengths, though star parts were played by drummer Bill Bateman (Blasters) and never-stagnant singer/harper Lester Butler, one of the few to handle Muddy’s “Louisiana Blues.” Butler spontaneously fulfilled a request for one of the slow songs to a fan who was killed earlier that week, though hopefully no one outside of those involved had been in the painful mistake still in his ready-made text. No, of course there is a festival for people like us to get back to. And we were. You are currently browsing the No Fightin': The Red Devils, Lester Butler & California blues, rock and roots music blog archives for December, 2011.